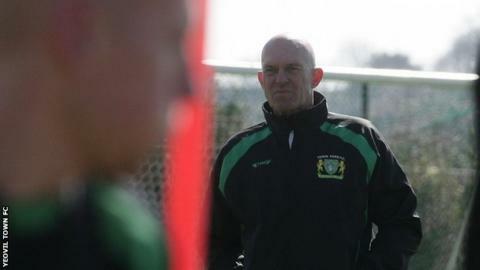 Yeovil Town caretaker manager Neale Marmon has revealed he will stay in charge for the rest of the season. And the 57-year-old says the club's proposed new owners plan to appoint him as sporting director this summer. He has taken over after Darren Way was sacked with the club just two points above the League Two relegation zone. "On Sunday I had the call asking would I jump in and help for the last seven games of the season and of course I'm relishing it," said Marmon. Yeovil are close to being taken over by American investor Rob Couhig, with the deal subject to approval by the English Football League. Marmon indicated the plan to make him sporting director is dependent on the Glovers, who have lost 10 of their last 12 games, retaining their League Two status. "I'm here until the end of the season but with the new consortium coming in the plan was to basically put me in a position as sporting director - but we'll have to wait and see what league we're playing in," he told BBC Somerset. "But I've been able to watch the players since January and I've had lots of talks with them so it wasn't a very difficult decision for me to say I'd like to do it." Yeovil have been in the EFL since 2003-04, having won the Conference title the previous season, and Marmon has an inexperienced squad to work with as he tries to bring about an upturn in results. "The squad is very young, the youngest in all four divisions, and the atmosphere that was cooking up in the stadium here in Yeovil was getting very intense and I don't think it's really conducive for young players to play football in that atmosphere," he said. "I'm a bit older than most coaches. I'm nearly 60 now so I've been in the game a long time. "I think I'm a bit more chilled and not really worried what is going on behind the scenes and my job picking the players up and giving them bags of confidence to play football the way they can."